They say the best way to learn something is to teach it. 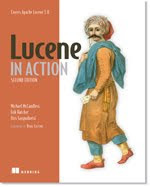 Well, I say writing a book sure counts as teaching because writing the 2nd edition of Lucene in Action sure has taught me all sorts of juicy details about Lucene, far more than I would have learned on my own. I can also say that writing a book about an active open-source project is very demanding. I try to keep the manuscript current, as changes are happening to Lucene, but then more than once I've been burned by keeping it just a little too current, only to see that the community up and changed its mind on something I had already folded into the book's manuscript and source code! Finally, as Lucene is getting very close to releasing 2.9 I'm now scrambling to fix the loooong tail of little things all throughout the book. Even once I finish that, it's several more months for a deep technical review, Manning's production process, etc. I'm looking forward to finishing! I just love how kids think. It's so carefree and unrestrained by all the silly "limitations" we adults have learned with time. Here's an example: we just finished a vacation with cousins (my kids' cousins). They were all in the car yesterday, eagerly discussing Halloween and who's going to wear what costume. But then they all realized and lamented that in fact they would not be together for Halloween. So, immediately, my son said "Dad, can we fly to California for Halloween?". It just tickled me pink! See, we live in Boston, MA, so flying to California is easily a 9 hr affair, one way, "door to door". Not to mention, expensive! But my son's thinking of course wasn't restrained by such silly things. As adults the idea would never be allowed to cross our mind. Somewhere, deep in our brains, is a group of neurons that quickly and mercilessly kills off such thoughts before we can even think them. But there's no such limitation, yet, with a kid's mind. If you spend even a small amount of time with any child, you'll see many examples of this unrestrained thinking, and it's delightfully refreshing. We all should strive not to grow up. It's easily the best thing you could do for yourself! The bottled water industry is truly silly. It's an enormous money-maker, a $20B industry in the US alone. You're buying a product that's hundreds of times more expensive than tap water. Yet, often the bottled water simply comes from a municipal source anyway. Furthermore, it's easily less safe than your tap water. See, the EPA has tougher regulations for tap water than the FDA has for bottled water. For example, the FDA allows some contamination of E Coli, and does not require testing for known parasites such as Cryptosporidium or Giardia Lamblia. Likely your bottled water does not contain Fluoride as well. Not to mention the insane consumption of oil required to schlepp around all this bottled water and then again to discard the empty plastic bottles. You should of course recycle them, but precious few of us actually do and so they fill up landfill, a "gift" from us to our future generations. Or perhaps your empty bottles end up in the Great Pacific Garbage Patch. And as if all of this weren't already reason enough to avoid bottled water, there is the curious problem of the chemicals in plastic, such as Bisphenol A (BPA), leaching into the water over time. Previously, it was believed that these chemicals didn't easily leach unless the plastic was hot (this is why you're not suposed to put plastic containers in the microwave or dishwasher). However, this delightful study showed that simply drinking bottled water increased BPA in urine by 2/3rds. Perhaps bottled water should include a clear "bottled on" date so you can at least roughly gauge how much BPA you're about to drink. Plastic is clearly an incredibly useful material, and I'm sure we'll eventually sort out the problems of the various chemicals that leach from it. In the meantime, I simply play it safe by avoiding plastic touching our food/drink, when practical. For example, we only put glass ware in the microwave, and when we need to carry water on-the-go, we always use a Klean Kanteen. In fact we now have many Klean Kanteens: in the car, in the stroller, next to the kid's beds and in our home offices, on the dining room table, etc. I find myself, this quiet Saturday morning, in Falmouth MA, staring down the barrel of Hurricane Bill! Seriously, it's headed straight for us, having gained strength last night. Yet, we're planning to go happily to the beach this morning, anyway. Why play chicken with a hurricane? Because the computer models at the National Weather Service insist that Bill will take a turn northward, sometime very soon, and not in fact touch Cape Cod at all (though it is projected to make landfall in Nova Scotia Sunday PM). We place alot of confidence in our computer models these days, and I sure hope they're right. I was in Falmouth for Hurricane Bob in 1991 and it was stunning. Have you ever tried to stand up when 100 mph sustained winds are blowing at you? It's quite an experience, and the resulting damage was unreal. I've found that for most people, but especially kids, the anticipation leading up to something is a sizable part of the fun. If you have an exciting vacation coming up, take every chance to remind your kids that it's coming, what the plans are, etc. If you don't, they've missed out on half the fun! I'm also convinced that this is why so many people can go to the Disney parks. The lines are amazingly long, and the actual rides amazingly short. It's the anticipation of going on a ride that keeps you happy. Seriously, could we possibly have picked a worse plant for our yards than "grass", even if we tried? I mean the stuff is so sickly, it has no prayer of living on its own in our local climate. It requires massive amounts of life support just to barely eek out an existence. I'll admit, with all the life support, grass can be truly beautiful. But the price we pay to reach that beauty is ridiculous. We dump hundreds of gallons of water on the stuff, every night, using sprinkler systems now built standard into the ground for new homes. This of course leaches all nutrients from the soil. Worse, grass is nitrogen-leaching: it removes nitrogen from the soil. So we must dump on loads of fertilizer to put it back. Being on such luxurious life support, the grass grows like it's in a jungle, and so we are forced to mow it, at least once per week. While leaving those clippings in place would make great natural fertilizer (after all, this is where all the fertilizer went! ), it's not pretty so we truck the clippings away and dump them somewhere else. Of course, lots of other plants thrive, too, even better than grass. We like to call them "weeds", since they are not grass. And so we must dump toxins over the yard to kill them. We dump separate toxins to kill all sorts of bugs. Sometimes, from too much water, a fungus develops, so we dump something else on to kill that. All this stuff we dump on the yard likely endangers our kids, us, and our pets, but somehow we don't seem to care. It also kills off the worms that'd naturally aerate the soil, and so we must do our own forced mechanical aeration. It messes up the pH balance, so we dump yet more stuff on (lime, sulphur) to fix that. In fall, when the leaves drop on the weak grass, we must quickly rake or blow them off, because the grass dies off quickly if it's left covered by leaves. After winter, which the grass barely survives, some of it has died off and turned brown. This is fully natural, and that dead grass would normally serve as nature's fertilizer, yet we don't like the color, so we dethatch and reseed. These practices don't end with grass, of course. We truck in loads of mulch, the lipstick of modern lawn care, each year. We spray all sorts of toxins on the trees, the bushes, etc. Terminex shows up, spraying all sorts of other toxins. People with blowers show up and blow every last little thing off the asphault of your driveway. This whole ritual is now commonplace. It's assumed, accepted and expected practice. If you don't subscribe to the life-support grass movement, people think something is wrong with you. How did we get ourselves into such a mess? Can't we, instead, find a plant that has no trouble surviving in our natural climate, with zero life support? Why did we all fall in love with this sickly life support grass, anyway? For example, crabgrass thrives. It's very hardy, grows with no additional watering, takes care of seeding by itself while grass never succeeds in seeding itself (presumably it's been selected and bred not to). Clover is another example, and has the advantage of being nitrogen fixing (the exact opposite of grass): it extracts nitrogren from the air and puts it back into the soil. This is why it's such a dark green even without fertilizer.